Eating a big breakfast can boost fertility in women with PCOS, according to a new study published in Clinical Science. According to researchers from the University of Tel Aviv, women with polycystic ovary syndrome (PCOS) are typically insulin resistant. A person who is insulin resistant produces too much of the hormone insulin. Excess insulin in a woman’s body eventually travels to her ovaries; high levels of insulin prompts the ovaries to produce testosterone, which decreases fertility. In the study, researchers randomly assigned 60 women with PCOS to one of two groups. Both groups ate 1800 calories each day but consumed the bulk of their calories at different times of the day. The first group was the “big breakfast group.” Participants in this group consumed 980 calories at breakfast, 640 at lunch, and then ate a 190-calorie dinner. Participants in the second group, known as the “big dinner group” consumed 190 calories at breakfast, 640 at lunch, and ate their largest meal, 980 calories, at dinner. After 90 days, researchers tested the insulin, glucose and testosterone levels of all participants and analyzed ovulation and menstrual information. Although neither group showed a changed in body mass index, the “big breakfast group” showed 56 percent less insulin resistance and a 50 percent reduction in testosterone levels. Additionally, the participants who ate a big breakfast showed a 50 percent rise in ovulation rate. The “big dinner group” maintained high insulin and testosterone levels. The “big breakfast diet” is not for weight loss but is more of a tool for controlling insulin levels. Consuming more calories in the morning than at night can also help reduce symptoms of PCOS, such as unwanted body hair, oily hair, hair loss, and acne. Professor Daniela Jakubowicz, who led the study, says the program can also reduce the risk for type II diabetes. Jakubowicz D, Barnea M, Wainstein J, Froy O. "Effects of caloric intake timing on insulin resistance and hyperandrogenism in lean women with polycystic ovary syndrome." Clin Sci (Lond). 2013 Nov 1;125(9):423-32. doi: 10.1042/CS20130071. Ellis, Marie. 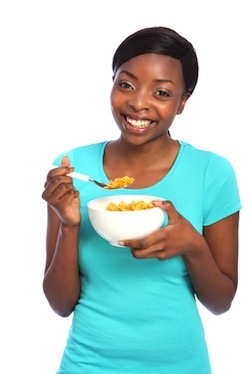 "Big breakfast diet could 'boost fertility for PCOS women'." ">Medical News Today. MediLexicon, Intl., 16 Aug. 2013. Web. 21 Aug. 2013.